Update September 28: Some readers have pointed out that a few schools on the list are open but have a different address. This appears to be due to NCES assigning schools a different ID when they change districts. While this does not appear to affect a large number of schools on the list, it does affect some, and the editors appreciate the crowdsourcing help to clarify the list. CMD will post an updated version as soon as possible. Today, the Center for Media and Democracy is releasing a complete state-by-state list of the failed charter schools since 2000. Among other things, this data reveals that millions and millions of federal tax dollars went to "ghost" schools that never even opened to students. The exact amount is unknown because the U.S. Department of Education is not required to report its failures, where money went to groups to help them start new charters that never even opened. This data set also provides reporters and citizens of each state an opportunity to take a closer look at how much taxpayer money has been squandered on the failed charter school experiment in their states. The data set and the interactive map below are based on more than a decade's worth of official but raw data from the National Center for Education Statistics (NCES). This release comes as the U.S. Department of Education and industry insiders currently deciding which states to award half a billion dollar in grants designed to bolster the school privatization industry under the federal Charter Schools Program (CSP). As CMD has calculated, nearly 2,500 charter schools have shuttered between 2001 and 2013, affecting 288,000 American children enrolled in primary and secondary schools, and the failure rate for charter schools is much higher than for traditional public schools. For example, in the 2011-2012 school year, charter school students ran two and half times the risk of having their education disrupted by a school closing and suffering academic setbacks as a result of closure. Dislocated students are less likely to graduate. In 2014 study, Matthew F. Larsen with the Department of Economics at Tulane University looked at high school closures in Milwaukee, almost all of which were charter schools, and he concluded that closures decreased "high school graduation rates by nearly 10%." He found that the effects persist "even if the students attends a better quality school after closure." Hidden behind the statistics are the social consequences. According to 2013 paper by Robert Scott and Miguel Saucedo at the University of Illinois, school closures "have exacerbated inter-neighborhood tensions among Chicago youth in recent years" and have been a contributing factor to the high rate of youth incarceration. Then there are the charter schools that never opened despite tax money from a federal program to help more entities apply to create even more charters. Drilling down into the data of just one state in just one school year, 25 charter schools (or, really, prospective charter schools) awarded grants in 2011-'12 never opened in Michigan. The non-profit groups behind these were granted a total of $3.7 million in federal tax money in implementation and planning grants, and they also received at least $1.7 million in state tax dollars. 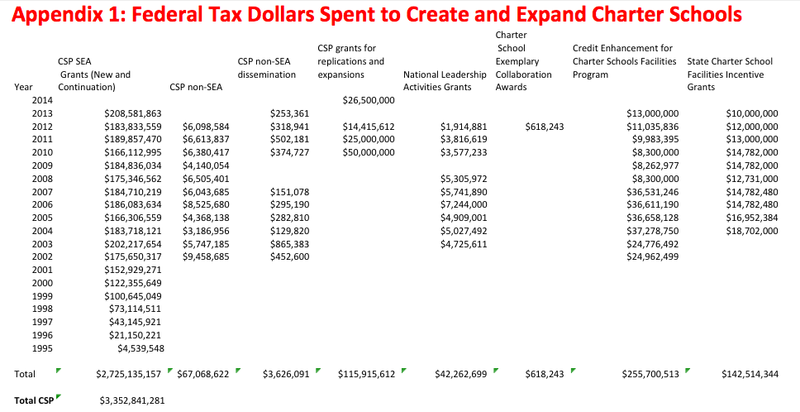 These charter schools exist only on paper, in this case on grant notification forms and in databases of state expenditures. As CMD has calculated, the federal government has spent more than $3.3 billion in the past two-plus decades fueling the charter school industry that has taken money away from traditional public schools. And, as the Center for Popular Democracy has demonstrated, more than $200 million of that money resulted in fraud and waste over the past decade. Click here for the full state-by-state list of charter schools that have closed between 2000 and 2013. Source: NCES Common Core of Data Public Elementary/Secondary School Universe Survey for school years 2000 to 2013. Data are available at https://nces.ed.gov/ccd/pubschuniv.asp. For purposes of this analysis, schools coded in the survey as "closed since last report," and "inactive-temporarily closed" were deemed closed. Schools that changed status from "charter" and "open" to "not applicable" and "closed" in subsequent year were also deemed to be closed charter schools. Additionally, schools coded as open charters in one year that then are missing from the survey for at least the next two subsequent years are also deemed to be closed. This is alarming! Can we not understand that Charter expansion is another huge ploy by the very wealthy to control education, the most important factor besides health care in this country? What do these billionaires know about what takes place in an educator’s job to inspire young people to find that passion to have a fulfilling life? The outrageous , No Child Left Behind, blindly followed by Race to the Top, line the pockets of so many corporations with all the “pre-tests” and “tests” purchased by the school districts. Meanwhile, educators no longer have time in their robotic day for creative instruction including art, music, hands on projects, dialoging with the students, engaging in critical thinking instruction. The total demise of vocational classes for this One Size Fits All teaching to declare that test scores determine achievement and student success is abhorrent! We are getting closer to the brink of an oligarchy, very, very frightening. Take a fixed pot of money, bring in high priced administration, siphon off corporate profit, and at the end of the day children receive a better education because government can't do anything right? Charter schools are not, and never were, anything but a scam designed to put public money into private pockets. "U.S. Department of Education is not required to report its failures" Gosh, I wonder who made that rule? Not. The GOP wants to "fix" Social Security by forcing disabled and retired people to eke out a reduced quality of life while throwing money at their cronies in the charter school movement. Raygun did it by deregulating savings and loans. Neal Bush profited from that move through Silverado Bank. Is Neal benefiting again through his "educational resource" enterprises? Bang nail hit squarely on the head.. While I agree there has been alot of charter schools come and go, in reviewing the Fresno information, two schools have changed in status but remain open: University High changed district sponors, and CART while no longer a charter school is still a school operating with special legislation from the State. What a piece of biased crap. What a piece of biased crap. Your data clearly shows that 943 of the 2209 schools NEVER OPENED. They were an idea that somebody wanted, but NEVER came to fruition. So, 1,266 were opened and have closed. In Ohio - of the 144 that ever actually opened, 33 were opened by Districts, and closed when either the grant money ran out of politics ran them into the ground. But, hey, don't let the truth or facts get into the way of your politics. @M Lombardo Yes, that was the point of the article! So WHERE'S THE MONEY that was given for these schools that NEVER OPENED? It looks like you are assuming that if a "YEAR NEW" date is not listed for a school, that school never opened. That may be true in some cases, but given that most of the "ENROLLLMENT FINAL YEAR" numbers for schools without "YEAR NEW" dates are non-zero, I don't think your assumption is valid. It's more likely that most of the schools without "YEAR NEW" dates simply opened before the data started being collected. That seems to be true for the first few schools listed that don't have "YEAR NEW" dates. For example, Takonta Training Center Charter School opened in 1996 and closed in 2001. In any case, the sentence in the article beginning with "As CMD has calculated, nearly 2,500 charter schools have shuttered between 2001 and 2013" should be edited, as it is misleading. Having said that, the vast majority of the schools on the list were open and then closed. The others seem to have received money without ever opening.